Grandmaster Richard Lee lives martial arts. He has successfully blended together Eastern philosophies with Western ideas, creating a roadmap to a successful life. Lee has mastered movement of the body while harnessing the power of the mind and is teaching others to follow in his footsteps by living life to its fullest. Grandmaster Lee is living proof that determination, hard work, desire, and principle can change a person’s life forever. He has become very successful in martial arts and in business, and has come a long way from his humbling beginnings. Grandmaster Lee comes from a background of warriors, people who fought for everything they had. His grandfather on his mother’s side was a well known wrestler of his time named Cyclone. Lee’s mother told him stories of her father leaving her with friends ring-side as Cyclone climbed up onto the mat to do battle and put food on the table. Lee’s father was a boxer who would box at local fairs, empty warehouses or anywhere that people would pay to watch him fight and help him provide for his family. Martial Arts was in Lee’s blood as he entered the world and has shaped him to be what he is today . . . a Grandmaster. When he was a child, Lee lived in a government housing project, located in a tough neighborhood in Connecticut. His father bought Lee a pair of boxing gloves when he was 4 years old, to teach him how to defend himself. Lee had to learn quickly, as his father, not knowing his own strength, broke Lee’s nose during one of his first lessons. At the age of 10, his father signed Grandmaster Lee up at the local YMCA. His father had some friends that were ex-Navy frogmen, now known as Navy SEALS, that helped Grandmaster Lee with his swimming. He was fascinated by the SEALS swimming ability, equipment, and their fighting techniques. Grandmaster Lee worked out in the pool every day and two and a half years later won the Connecticut State Swimming Championships in 1955. One day at the YMCA, in the mat room, he was involved in a match that left him beaten and bruised. It was received from a man in his thirty’s, smaller in stature but with a martial arts background. The fact that someone smaller could handle him so easily was the spark that ignited his desire to learn how to defend himself in any situation, on and off the mat. Several months later, Grandmaster Lee and some friends from the housing project ran into a gang from another housing project. He was blindsided with a punch that knocked him to the ground unconscious. When his father found out that he had lost the fight, he struck Lee with a furry of hand strikes that seemed to last for 20 minutes. It was the worst beating that Lee had ever received and he began his training with a new vengeance. In 1953, Lee began to learn hand to hand combat from the ex-Navy SEALS. They taught him rarely shown techniques that helped fuel Lee’s fire to learn more about martial arts. Although he was told he had a shot of being an Olympic swimmer, Lee found himself thinking about martial arts much of the time. In 1955, he won the Connecticut State Swimming Championships, and in 1957, the family moved to Northern California to continue Lee’s swimming training and Olympic effort.In California, he quickly enrolled in a Chinese Martial Arts school and met Al Tracy. Al was the late great Ed Parker’s top student and was helping Parker spread the teachings of Chinese Kenpo. The two quickly bonded as Tracy recognized Lee’s natural ability and deep desire to learn. Grandmaster Lee has always been quick to point out that Grandmaster Tracy was and is the most dynamic martial arts teacher he has ever known. After years of training, Lee became one of the first 50 people to receive a black belt in Chinese Kenpo. In 1994, he earned the highest honor of becoming a 10th degree black belt in Chinese Kenpo, one of only two in the United States. Grandmaster Lee started teaching martial arts in the late 1950’s and turned professional in the early 1960’s. In 1967 he established R.Lee Incorporated and founded East-West Kung Fu schools. East-West started with the idea of putting a Western face on Chinese Martial Arts. The Castro Valley school, the first ever East-West Kung-Fu school, was a former department store and was easily the largest martial arts facility in the United States at the time. Thirty three years later the school still remains active in its original location. As a point in fact, it was this very school that Grandmaster Lee trained the original United States team that went to the Republic of China to compete in the 1st World Kuoshu Championships in 1975. Many of the team members are still involved in teaching Chinese martial arts today. As a matter of fact, it introduced hundreds of thousands of people into Chinese Martial Arts. Grandmaster Lee stopped swimming competitively in 1960 and began to fulfill his destiny of becoming a Martial Arts Grandmaster. In 1972, he visited the Tae Kwon Do headquarters in Seoul, Korea during the “testing of the masters”. The soon to be masters were being tested for the 5th degree black belts and had traveled from the far edges of Korea for testing. The head of the Tae Kwon Do organization asked Lee to put on a demonstration in front of a very talented and distinguished audience. Following his performance, he was greatly honored by receiving a standing ovation and was presented a diploma for a 5th degree black belt in Tae Kwon Do. Later in 1972, he went to the Republic of China, Taiwan, to continue his training in Chinese Kuoshu. During this time, Lee was informed of plans for the 1st World Kuoshu Championships the world had ever seen. It was, in fact, the first tournament ever sponsored by the Taiwan government. Grandmaster Lee was asked to put together a team for the United States and proceeded to train 15 of his best students. These students went on to represent the United States in the first World Tournament and placed 1st in the foreign team division including a first place in the heavyweight grand championship. The team was praised not only for their martial arts ability but also for the professional and respectful manner in which they handled themselves throughout the competition. In fact, respectful professionalism has become synonymous with a Richard Lee team. One of Grandmaster Lee’s lifetime goals has been to raise the standard of Chinese Martial Arts in America both in its teachings and presentation to the American public.In 1975, at the first World Kuoshu Tournament, Grandmaster Lee met Grandmaster Huang for the first time. Circumstances would dictate that they wouldn’t meet again for many years. In fact, it wasn’t until 1988 when Grandmaster Lee and Grandmaster Huang again had contact. Grandmaster Lee had read about a National Tournament that Grandmaster Huang was hosting in Baltimore, Maryland. 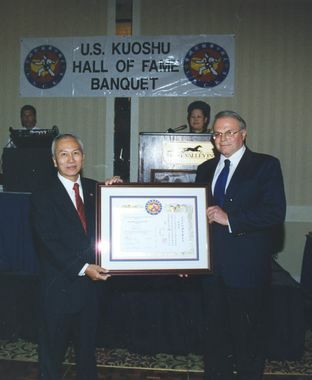 The tournament was the final qualifier for placement on the United States team for the 6th World Kuoshu Championships to be held in the U.S.A. in Las Vegas, 1989. Grandmaster Lee was very pleased when Grandmaster Huang remembered him from 1975 as the coach of the first ever United States Kuoshu team. Grandmaster Huang invited Grandmaster Lee to send some of his top students to compete for a spot on the U.S. team. Since the tournament was to take place in the summer of 1989, this left Grandmaster Lee with very little time to train his students. However, in less than one year’s time, he trained and sent four of the his best to try out. Remarkably, two of them made the U.S. team while the other two medaled. Grandmaster Lee and Grandmaster Huang have remained friends since and are in contact frequently. In fact, Grandmaster Lee was appointed Senior Vice President of the United States Kuoshu Federation in 1994. Since winning the World Tournament in 1975, Grandmaster Lee has continued his coaching of the United States team. in 1977 two of his students returned to Taiwan for the 2nd World Kuoshu Championships. In 1989 two more of his students competed in the 6th World Kuoshu Championships. In 1992 Grandmaster Lee coached 9 of the 17 team members, including two that won the Championships in the 7th World Kuoshu Tournament. Currently, he is training another large team that will compete in Baltimore in July. It will over ten years and he has sent a team of 30+ individuals to the Nationals. Despite traveling across the country, his teams have consistently done exceptionally well including several first place team awards. In 1994, Grandmaster Tracy presented Grandmaster Lee with his 10th degree black belt in Chinese Kenpo. The presentation was held in the presence of General Chen and General Wu, the president and vice-president of the International Chinese Kuoshu Federation respectively. Grandmaster Huang, president of the United States Kuoshu Federation was also in attendance. In addition, Grandmaster Raymond Go, head of the England Kuoshu Federation, and Grandmaster Li, head of the South American Kuoshu Federation, were also present. Additionally, Master Tat-Mau Wong, representatives from Senator Dianne Feinstien, and 200 of his students attended. Finally, Grandmaster Lee also received letters from President Clinton and Vice-President Al Gore.